Our Abpromise guarantee covers the use of ab1168 in the following tested applications. Characterization of leukemias and lymphomas in human lysed whole peripheral blood or mononuclear cells separated by density gradient. CD19 (PE) immunofluorescence analysis can be performed on a flow cytometerequipped with an excitation source of 488nm and fitted with logarithmic amplifiers. 10µl of CD19 (PE) is sufficient for labelling of 1x106 cells. ab91357 - Mouse monoclonal IgG1, is suitable for use as an isotype control with this antibody. Assembles with the antigen receptor of B lymphocytes in order to decrease the threshold for antigen receptor-dependent stimulation. Defects in CD19 are the cause of immunodeficiency common variable type 3 (CVID3) [MIM:613493]; also called antibody deficiency due to CD19 defect. CVID3 is a primary immunodeficiency characterized by antibody deficiency, hypogammaglobulinemia, recurrent bacterial infections and an inability to mount an antibody response to antigen. The defect results from a failure of B-cell differentiation and impaired secretion of immunoglobulins; the numbers of circulating B cells is usually in the normal range, but can be low. Phosphorylated on serine and threonine upon DNA damage, probably by ATM or ATR. Phosphorylated on tyrosine following B-cell activation. Flow Cytometry - Anti-CD19 antibody [CB19] (Phycoerythrin) (ab1168)Image courtesy of Ken Rogers by Abreview. ab1168 used in Flow Cytometry. Whole PBMC cells from Rhesus monkey were fixed with paraformaldehyde. The lymphocyte population was gated based on forward and side scatter properties. The cells within the gate were then analysis on 2 color dot plots with the CD19 (clone CB19) plotted on one axis and other lineage makers plotted on the other axis. CD3 and NKG2a positive population were negative for CD19 staining.All CD20 positive cells also stained positive for CD19. Addition analysis was carried out to verify that the monocyte and granulocyte populations were negative for staining with this CD19 antibody as is expected. Publishing research using ab1168? Please let us know so that we can cite the reference in this datasheet. Cell harvesting/tissue preparation method: Whole blood staining and PBMC isolated on a ficoll spin. The lymphocyte population was gated based on forward and side scatter properties. The cells within the gate were then analysis on 2 color dot plots with the CD19 (clone CB19) plotted on one axis and other lineage makers plotted on the other axis. CD3 and NKG2a positive population were negative for CD19 staining.All CD20 positive cells also stained positive for CD19. 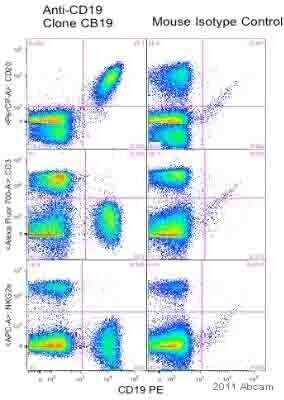 Addition analysis was carried out to verify that the monocyte and granulocyte populations were negative for staining with this CD19 antibody as is expected.